Touted in a two-page spread introduction as “This special issue…it’s offbeat, it’s different, we know you’re going to love it” couldn’t be farther from the truth; however, I hope they’re going to keep it up to keep with their claims. There’s some new art direction and Professor X is briefly reunited with his team, but there’s nothing overly exceptional about this issue that makes it stand apart from the last bunch. There’s a bunch of psi-powers at work now that Chuck is back and he’s delving deep into the kids’ minds to watch the Marauders do their thing and the formation of X-Factor, the team of original X-Men. It’s a bitter pill for the man to swallow. He, the New Mutants and the Starjammers are floundering in space. 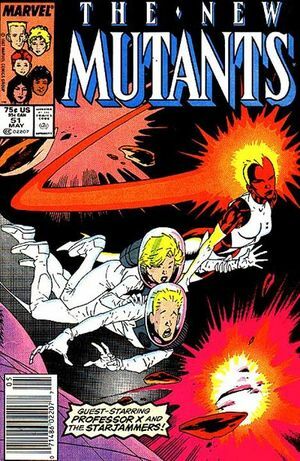 With the help of the New Mutants, the shuttle is being repaired, and none too soon. Shi’ar are hot on their trail and the Professor must choose. Limbo doesn’t want to transport the team back through Limbo, but Charles Xavier uses some dastardly moves to make sure this happens. And speaking of dastardly, Magneto makes the choice to become the new White King of the Hellfire Club, Storm standing by his side. Is this all for the greater good? Or Magneto’s?